In 1764 ‘After many dangers, toils and snares’, John Newton was finally ordained & arrived in Olney wondering if he was truly up to the job of Curate in charge of St Peter & St Paul’s. In 1767, widow Mary Unwin also brought her household here, which included her boarder William Cowper. 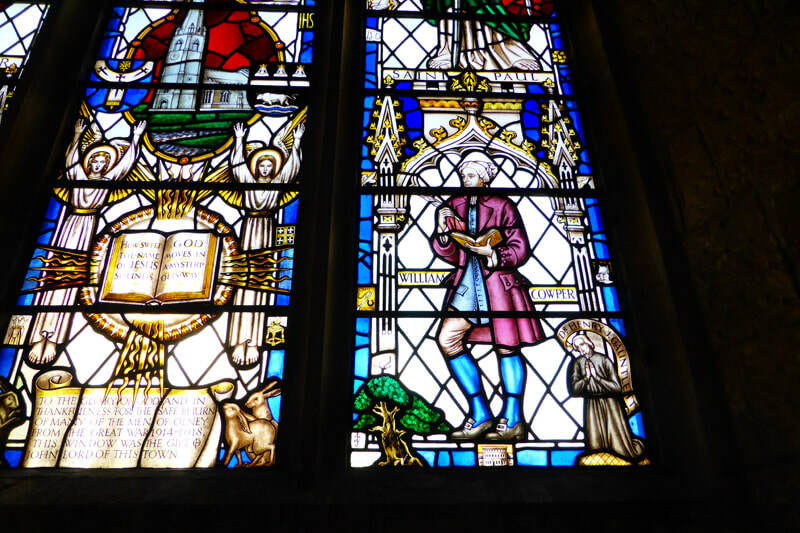 Walk in the footsteps of John Newton, celebrating the friendships which flourished & led to the writing & publication in 1779 of the ‘Olney Hymns’. The most famous hymn today is ‘Faith’s Review & Expectation’… or as we know it - ‘Amazing Grace’. Duration: approx 1 hour Tour distance: approx 1.6km or 1 mile. 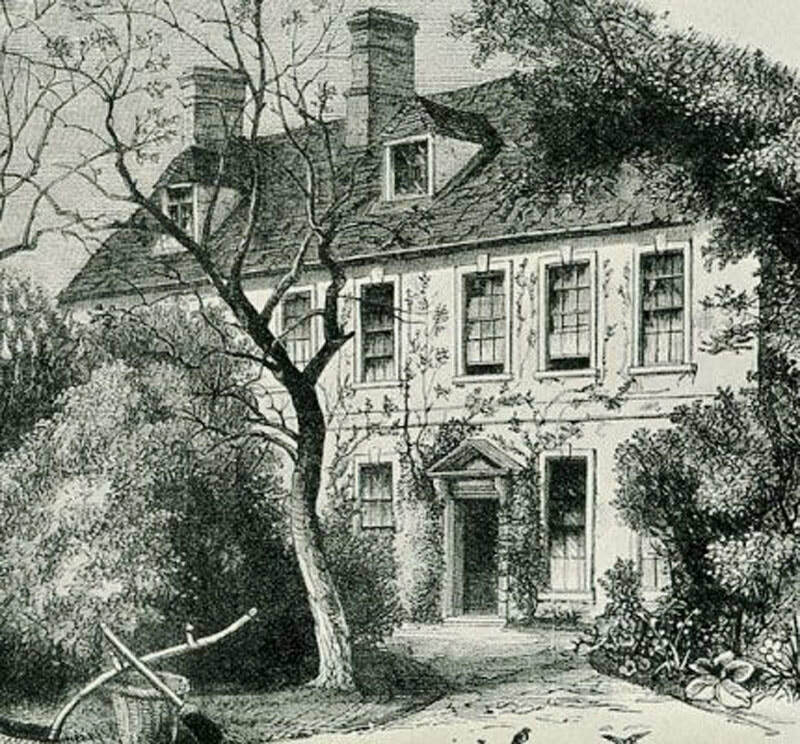 ‘Orchard Side’ was the home of Mary Unwin & William Cowper from 1768 – 1786 and is now the Cowper & Newton Museum. 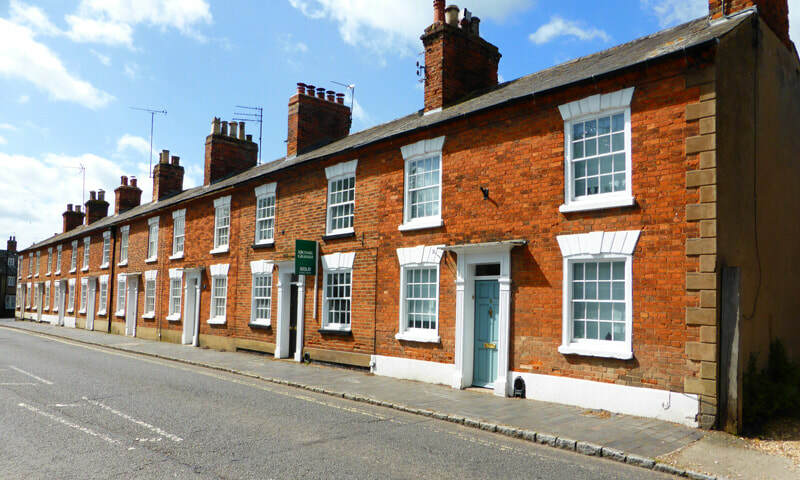 Looking at the front of the building you can spot the brick façade added around c1700 which ties 2 older properties together to create a more imposing home. 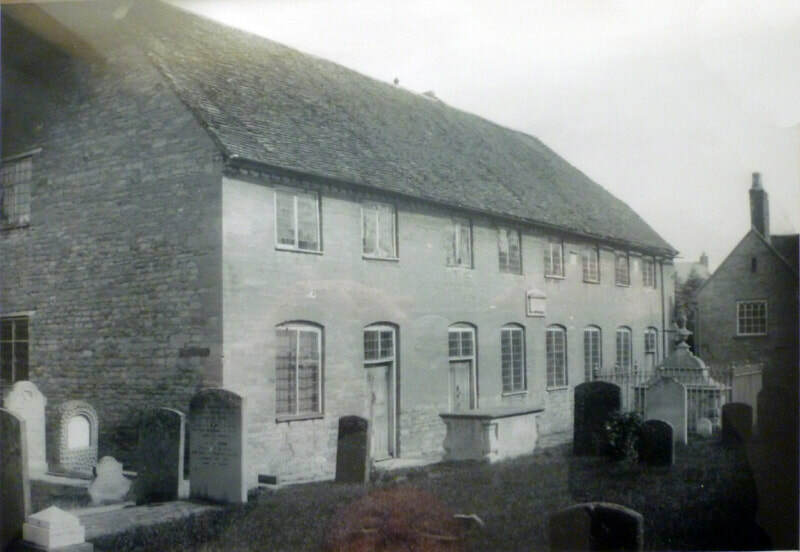 Mary & William had arrived in Olney in 1767 and lived with John & Mary (known as Polly) Newton until this house had been repaired and was ready for them to move in. In 1786 they moved to the nearby village of Weston Underwood. Start your walk across the road from the Cowper & Newton Museum. Stand on the pavement with your back to Market Place and the flower bed to your left. After finding out about the Museum move a little way to your right to look at the row of shops to the right of the Museum. In the middle of the row of buildings (now Costa) is the house & workshop of Ebenezer Abrahams who was once an important clockmaker. His wife worked with John Newton as he went about his business in the parish, so much so that he said: ‘I feel as if I have lost a right hand’when she died in 1774. 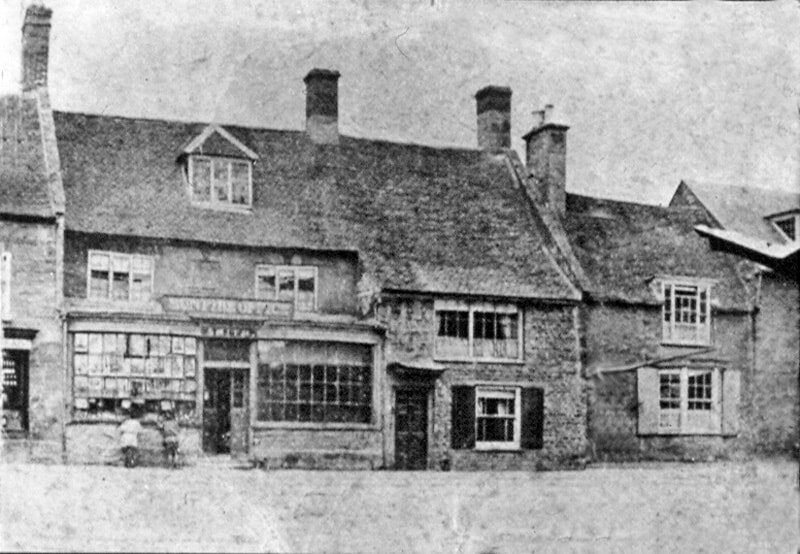 The image above is from before c1900 and shows more nearly the look of this row of shops & homes in the late 1700s. After eight years in Liverpool, Olney must have been a great contrast for Newton. However, within months of his arrival in 1764, he had become a celebrity with the publication of his book ‘An Authentic Narrative’. This became a best-seller with 5 editions within the first 6 months of its publication and published in many languages. People were enthralled by the stories of his childhood, life at sea, his struggles with his faith, love for his wife and his journey back to his faith. 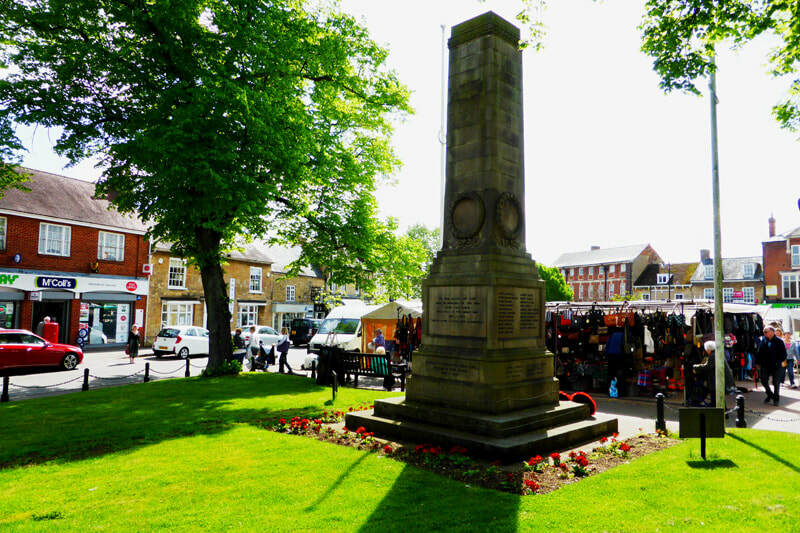 Follow the perimeter pavement around Market Place past the flowerbed then left again keeping the row of shops to your right and towards the War memorial at the top of Market Place. Close by used to stand the Round House which was the local lock up. You will see 18th century buildings to your right which have traded as shops such as drapers & butchers for centuries. 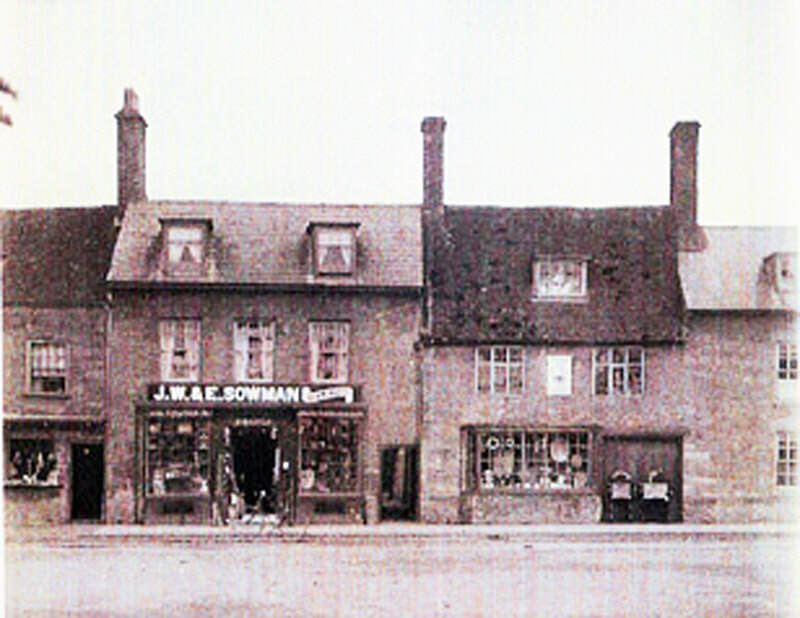 The current building was built in1904 for Sowman’s ironmongery business. However, the outbuildings to the rear could still be the original workshop of the Abraham family. Where the War Memorial now stands used to be the ‘Round House’. This was a ‘Lock Up’ housing suspected criminals before they were sent to court in nearby Newport Pagnell. We wonder if any of the ‘wild and lawless mob’ that threatened the Vicarage after John Newton had preached about not putting candles in windows for 5thNovember spent time here? Walk towards High Street and look across the road to the Olney Baptist Church. 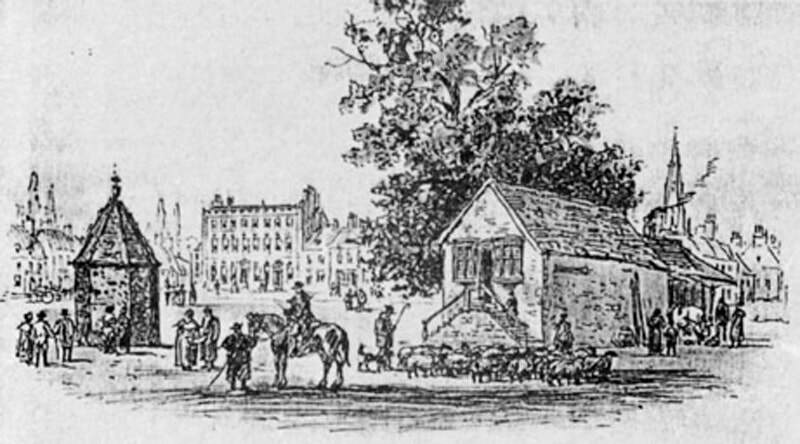 The Round House on the Market Place drawn by James Storer in 1821. 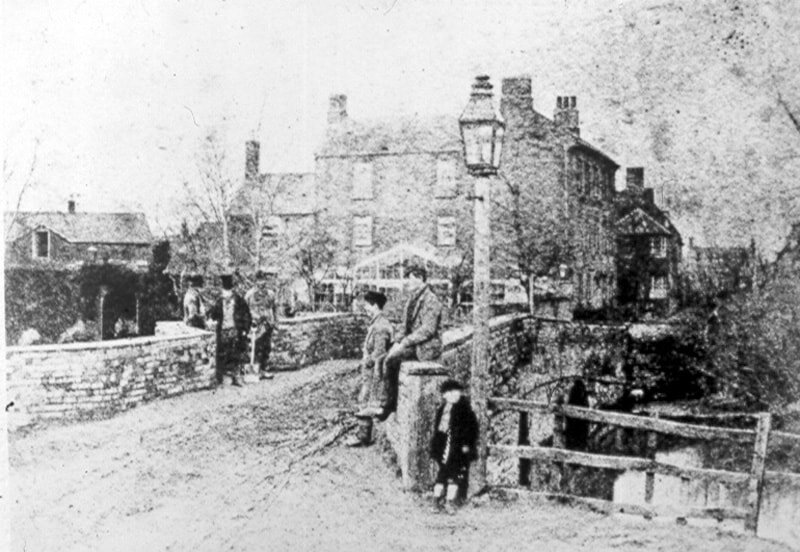 Taken down in about 1846, it was rebuilt further along the High Street. All that is left now is the stone ball which lives in the garden of the Museum. 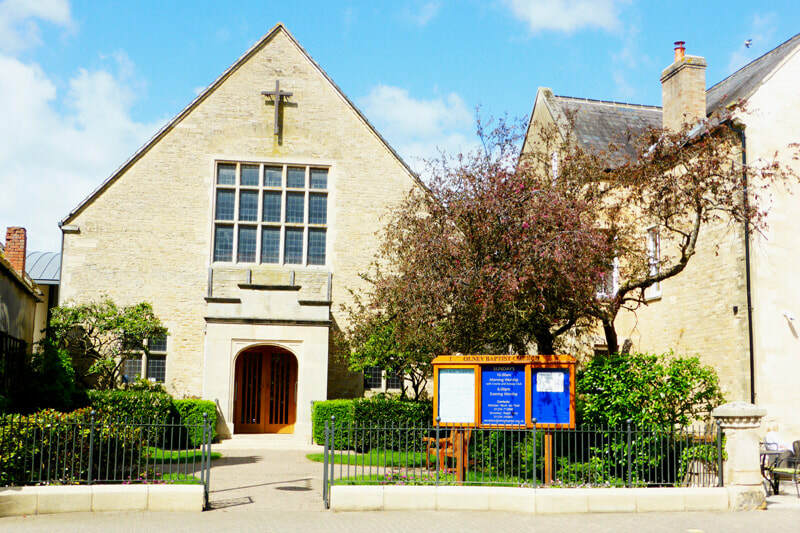 The Baptist Church began as the ‘Barn of John Kent’ which became a licensed meeting place in the 1670s and has been through several transformations including a total rebuild in 1893. In JohnNewton’s day a shop and house lay to the front. 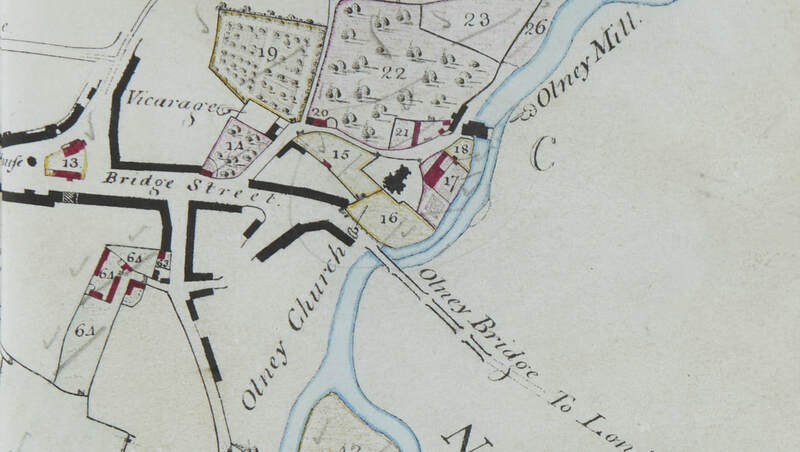 In 1775 John Sutcliff had settled in Olney, subsequently to become Pastor for thirty-nine years. John Newton was actually present at his ordination and described the service. The Association of Baptist Ministers also met in Olney. 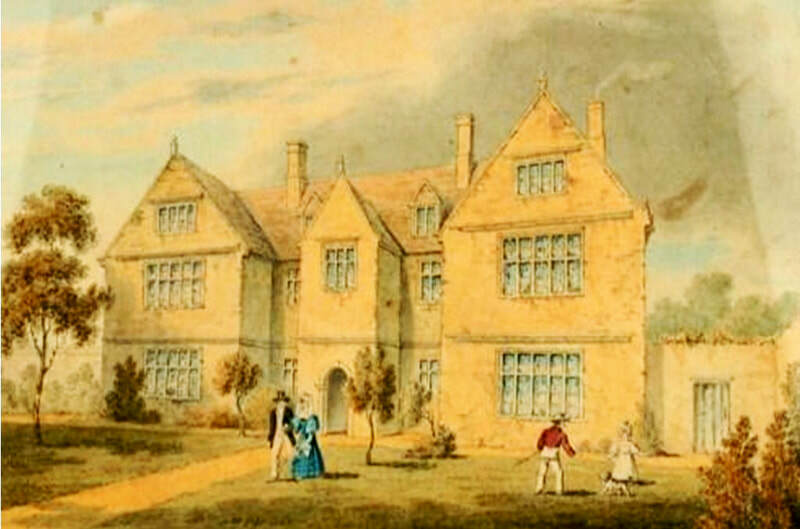 Sutcliff also lived and set up an academy or seminary in two adjacent houses further along the street to the right. Under his tutelage a number of prominent Baptist preachers developed, including William Carey who was instrumental in the formation of the Baptist Missionary Society in 1792 and became its first missionary in 1793. Around 1893 William Hipwell bought the shop & house and then demolished them to build a gable annex to his house next door. In the late 1930’s, the garden area was offered to the Baptists so they could construct a front entrance to their church. 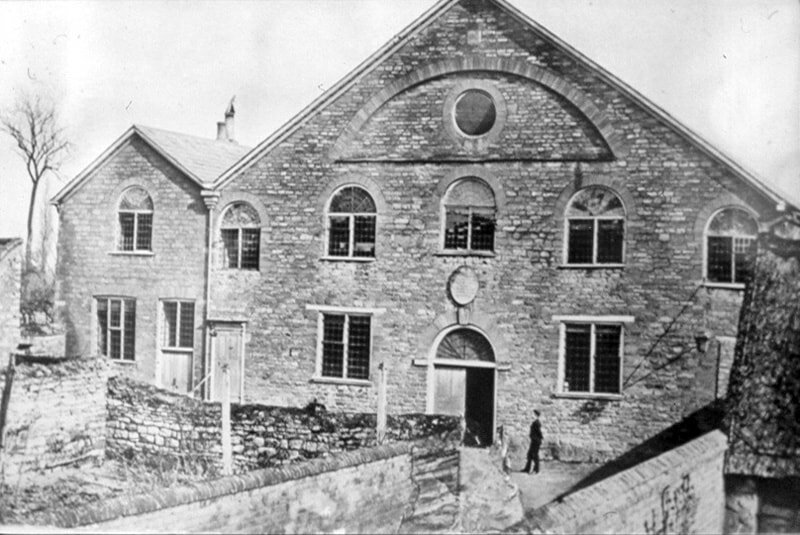 An early image of the side of the building from the lane alongside the church. The large house now The Cherry Tree was the Rev John Sutcliff’s lodging before getting married. His ‘digs’ were handy to walk from the garden, and through a door straight to his pulpit in the Baptist Chapel next door. 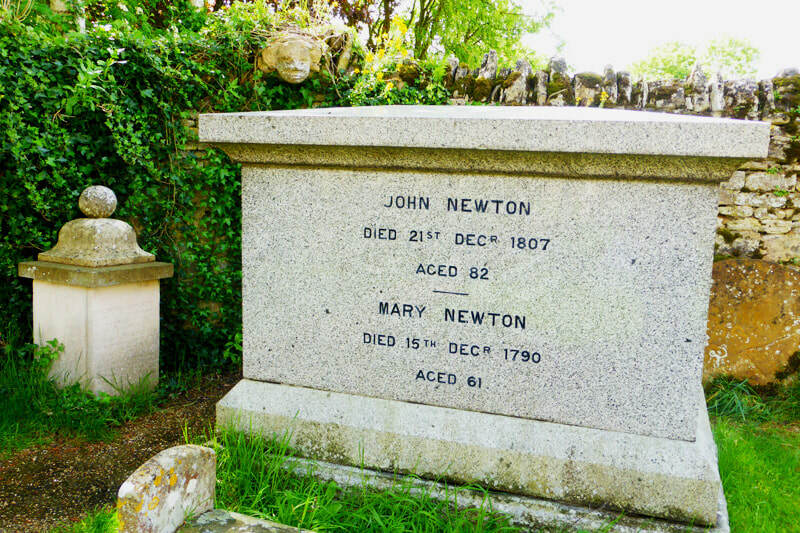 John Newton would have been a regular visitor to the house and its owners – Mr and Mrs Andrews. Look out for the date stone on the front of the building. 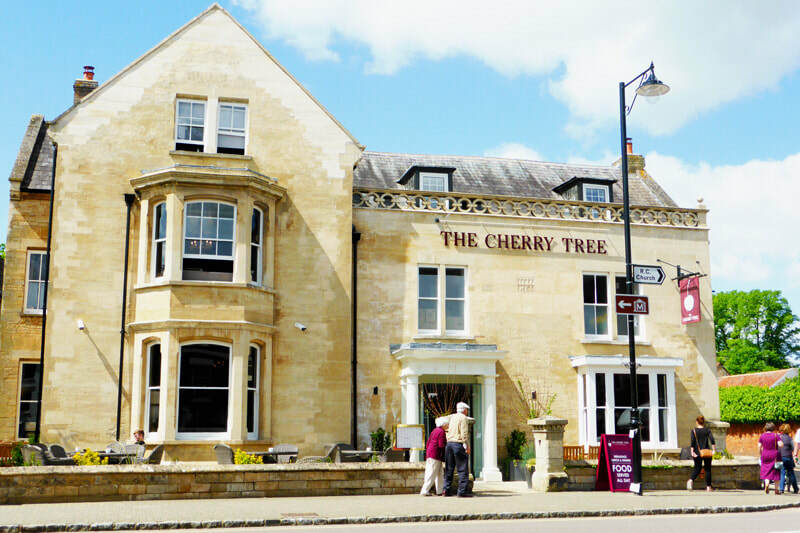 Now the Cherry Tree Restaurant, in the late 1800s it was owned by the Hipwell family, local brewers. 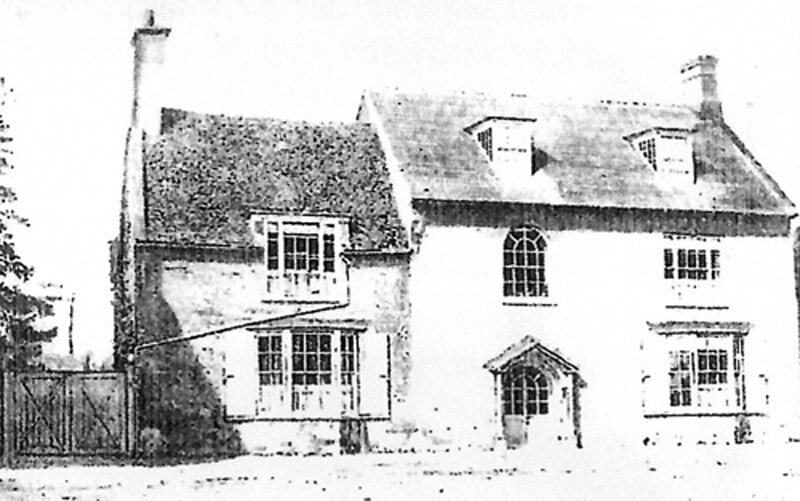 The building before the gable was added & looking more like it would have done in the late 18th century. Note the very narrow entrance to Spring Lane at this time, barely wide enough for a horse and cart. The United Reformed Church is set-back from the pavement and covers the site of the old Independent Chapel built in 1762. 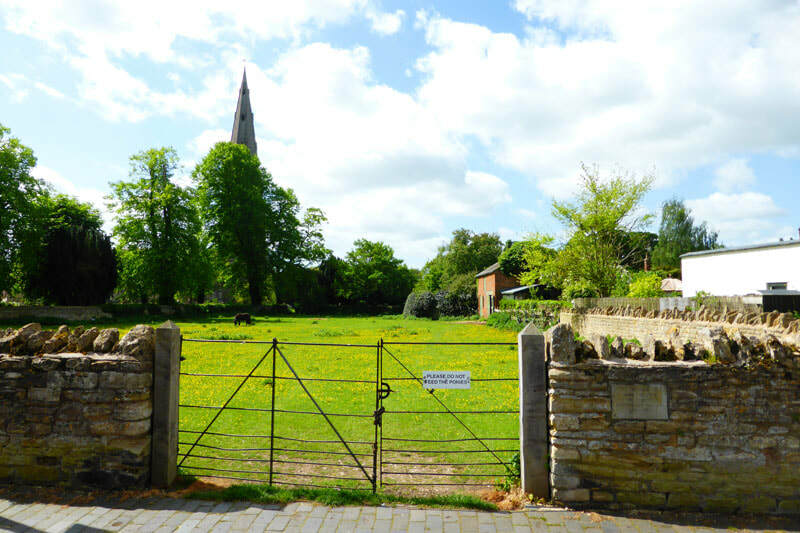 That long-lost Chapel is where John Newton gave some of his ‘New Year Sermons for Young People’ and was part of the close friendships and partnerships between the faiths in Olney at that time. 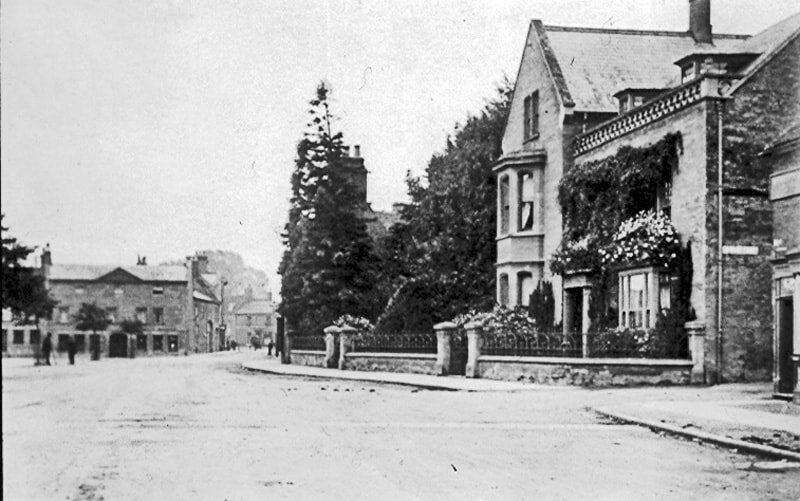 The building we see today arrived in 1880 but the photograph shows the earlier 18thcentury building and before the houses to the front were purchased and demolished. You can see the remains of the demolished house on the cottage wall above the passageway. If you have the opportunity to look inside, you will meet our Clockmaker, Ebeneezer Abrahams once again. 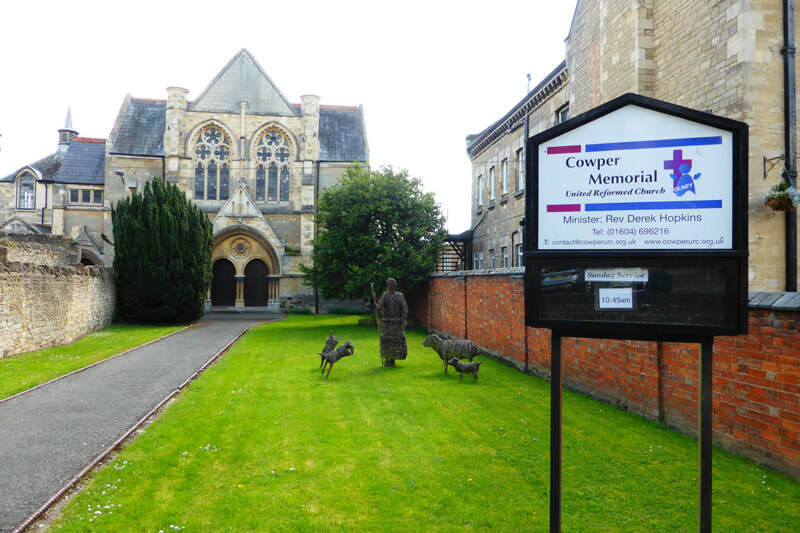 The chapel was renamed the Cowper Memorial Congregational Church in 1880 & is now known as the Cowper Memorial United Reformed Church. 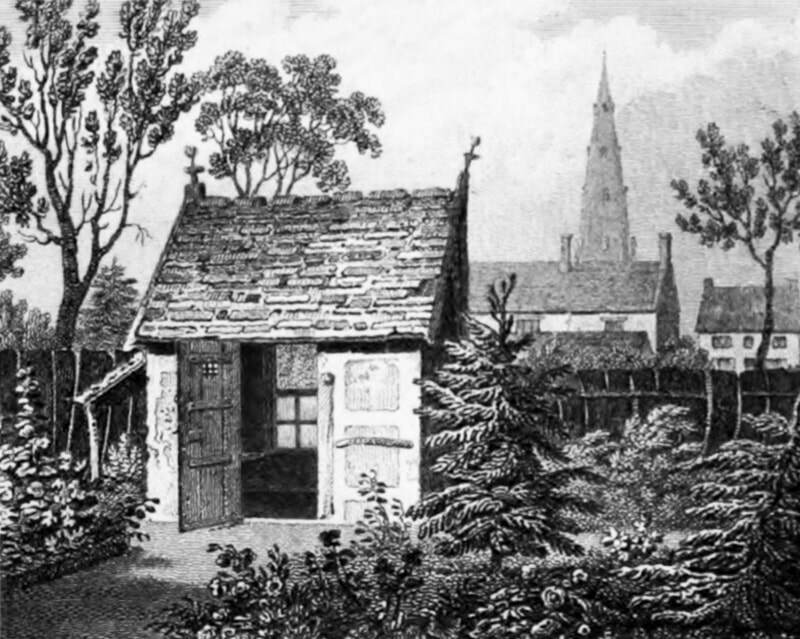 An early view of the Independent Chapel with the garden of house fronting onto High Street still in place. 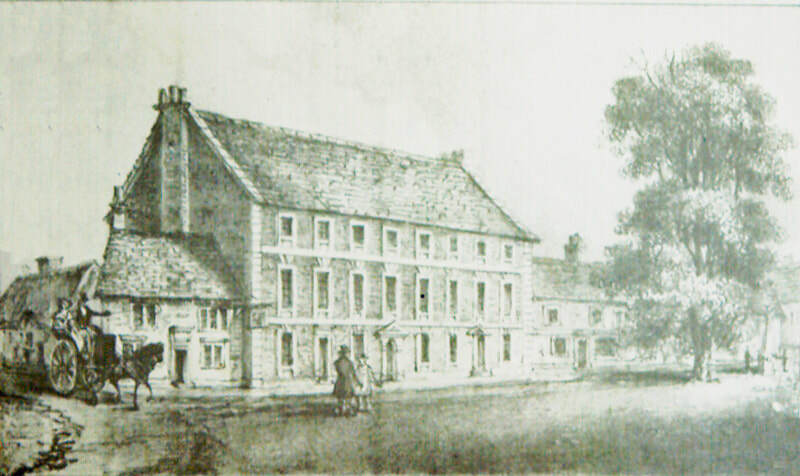 The Bull is an old coaching house (larger building to the left) which gave William Cowper and Mrs Unwin a bed during 1771. Their motives were entirely innocent, though. One of the servants at Orchard Side had developed Smallpox and they had to avoid infection. 'How can you bear to be amongst Bulls and Bears? 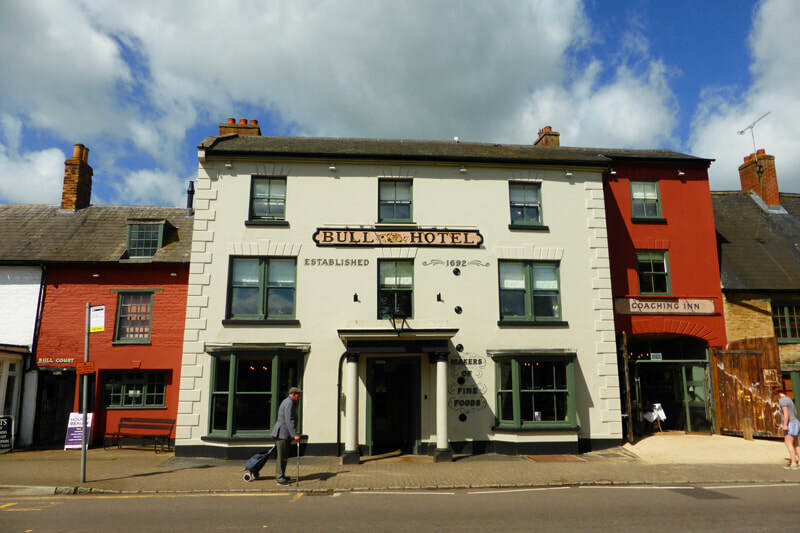 'John wrote, referring to the former name of the adjoining common alehouse, the Dog and Bear. Bear Lane and the original entrance to the Baptist Chapel lies to the right. Beer for the Inn and the rest of the town was brewed in a building to the rear, now the carpark. 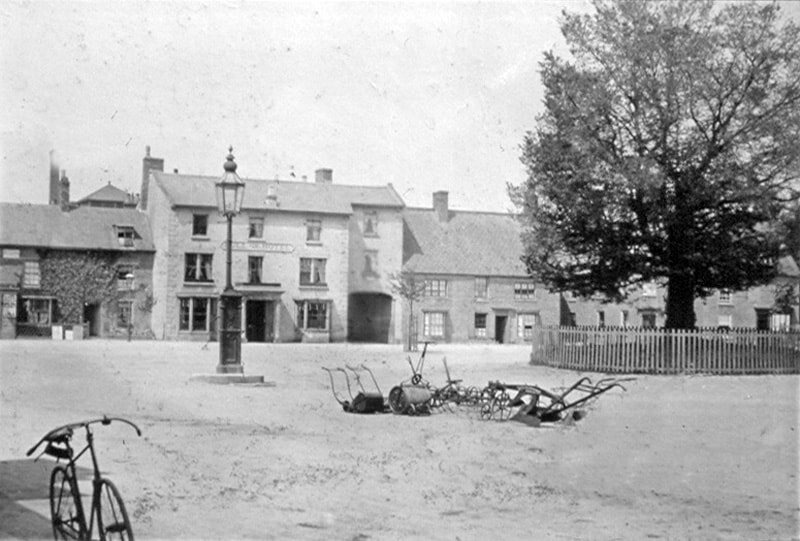 Early image across Market Place to the Bull Inn. The town water pump is also visible with a light on the top – you will find out more about this later in your walk. 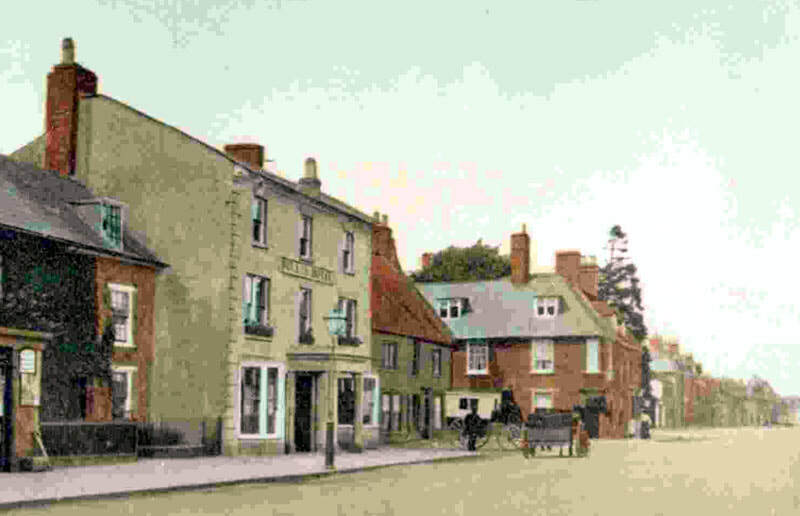 The Bull from a hand-coloured photograph around 1900. The Shiel Hall was taken down in 1816 but originally stood on Market Place where the public toilets are now located. It had many uses in its time including being the Town Hall but in 1775 John Newton persuaded Samuel Teedon to relocate from Bedford to run a school from here to teach the sons of Olney’s tradespeople to ‘read and write and cast accounts’. A blacksmith’s forge was located at the southern end of the Shiel Hall. This was the site of the Poor House & Work House in the 1700s and would have been a place John Newton knew well. 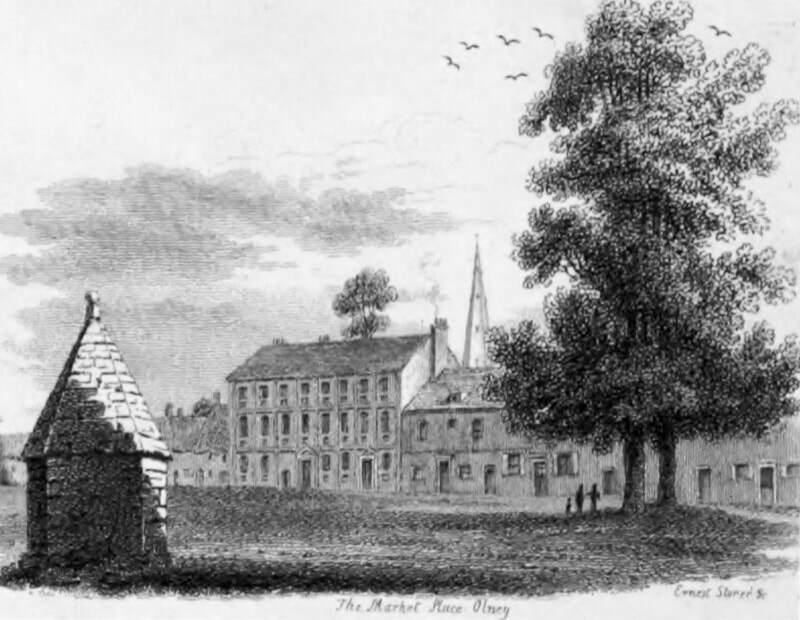 One commentator described many of the people of Olney as ‘half-starved and ragged’. There is no image of the Poor House & Work House but we have a written description from 1724 about the ‘care for the poor’. ‘That if any person refuse to work orderly, and so many hours as the Master of the House shall command them, they shall be sent to the House of correction. That if any person will not work, pretending to be sick, which may be discovered by their stomachs or otherwise, they shall be severely punished. Continue your walk towardsOlney Bridge crossing over Church Street. 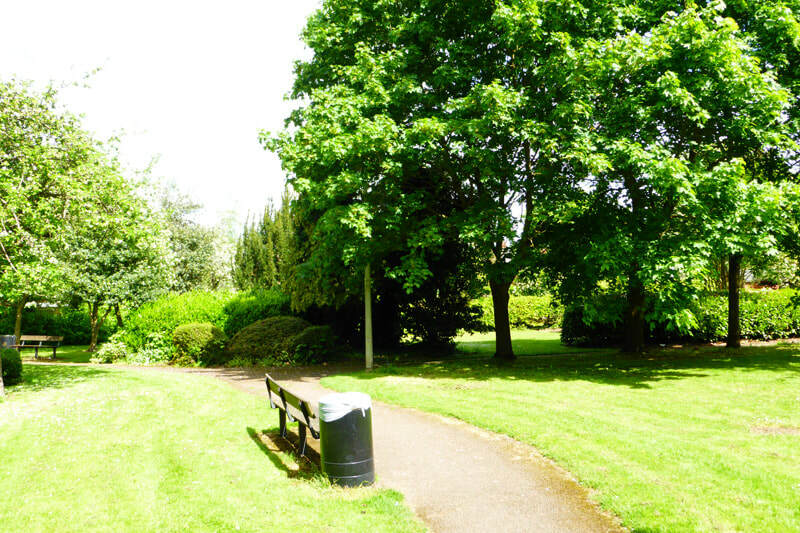 You will also see the entrance to Emberton Country Park across the road. 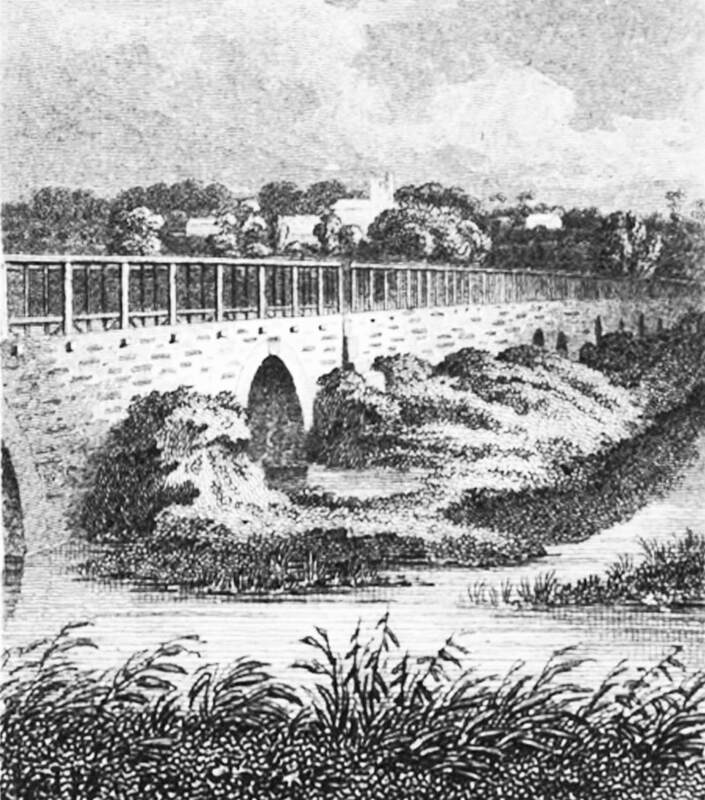 The bridge was also the site of a Civil War battle in 1643. Parliament held Newport Pagnell, and Olney was one of its outposts. Prince Rupert held Northampton for the King and marched on Olney intending to continue on to Newport. 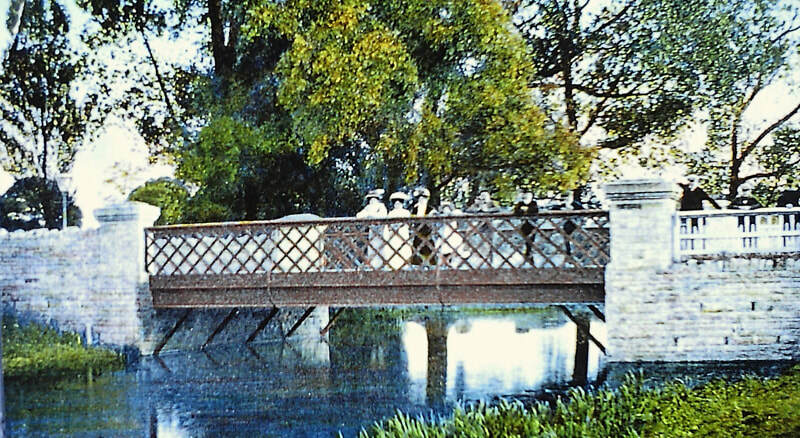 The Olney forces were taken by surprise and the Parliamentarians retreated to the bridge where they made a defiant stand. The Royalists could have won decisively, had it not been for a rumour that Cromwell’s reinforcements were seen coming from Newport. The Royalists retreated and the battle was over. The bridge is actually 2 bridges spanning the River Ouse and the leet to the Mill. 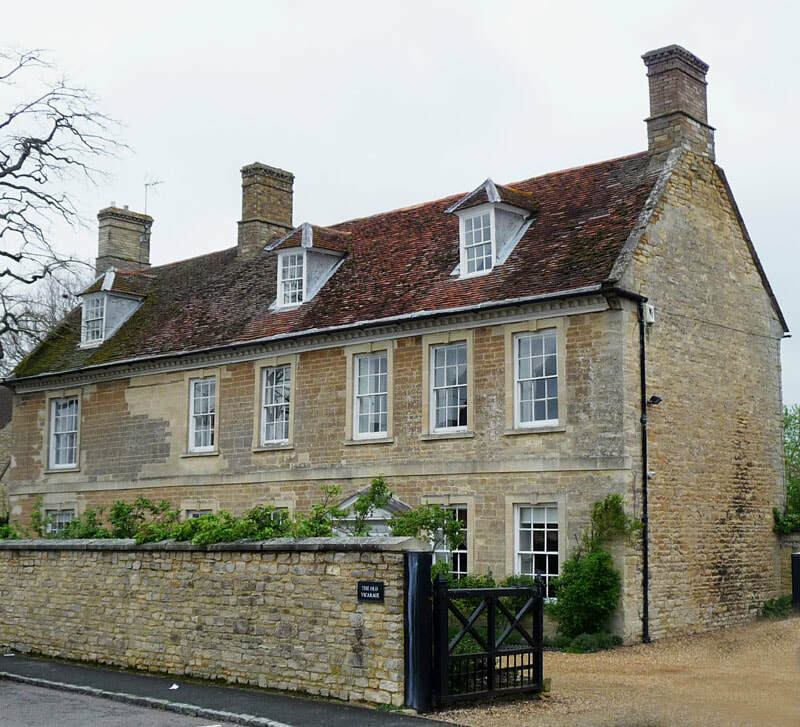 John Newton’s former home, ‘The Old Vicarage’ has a direct view across to his Church. It was virtually rebuilt for Newton in 1767 by his patron Lord Dartmouth. Despite its size, Newton operated an open-house policy at his vicarage for people who travelled for miles to hear him preach, inviting them for supper after evening services. He had to start issuing tickets when his suppers becametoopopular. We wonder what his wife Polly thought about this! This house is in private ownership, but two biblical texts which John Newton had painted on the wall of his study survive inside the house to this day. In a letter to Lord Darmouth John explained that he had chosen these words to be a reminder ‘from day to day what I was, and by what means I am now undeservedly settled in the Vicarage at Olney.‘ They were positioned to ensure he never forgot how different his life was in 1767 from his life back in 1746. In that year, whilst in the land-based slave trade himself, he had become ill, was starved and finally locked to the deck of his master’s boat. John Newton did much of his sermon writing in his attic study. 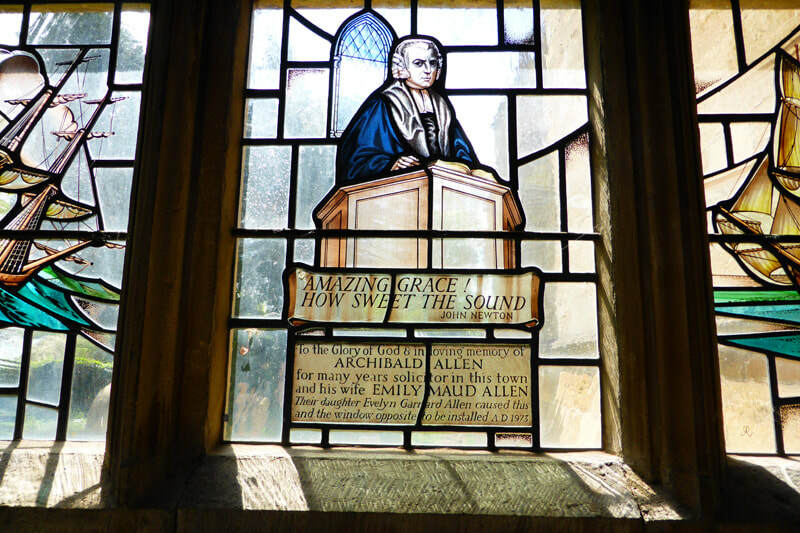 It is highly likely that ‘Faith’s Review and Expectation’ (Amazing Grace’) was written by him in the weeks leading up to his New Year’s Day service on 1st January 1773. When William Cowper arrived to live in Olney in 1767 a friendship had grown quickly between the 2 households and both William & John began writing new hymns for the local congregation to sing at friendship groups in houses and the Vicarage, as well as in Church. In 1779 the hymns were collected together and published by John in a hymn book titled ‘The Olney Hymns’. All 348 hymns in the hymn book were written by William Cowper or John Newton. John had hoped that William would have written the majority but a severe depression in 1773 brought an end to his hymn writing. 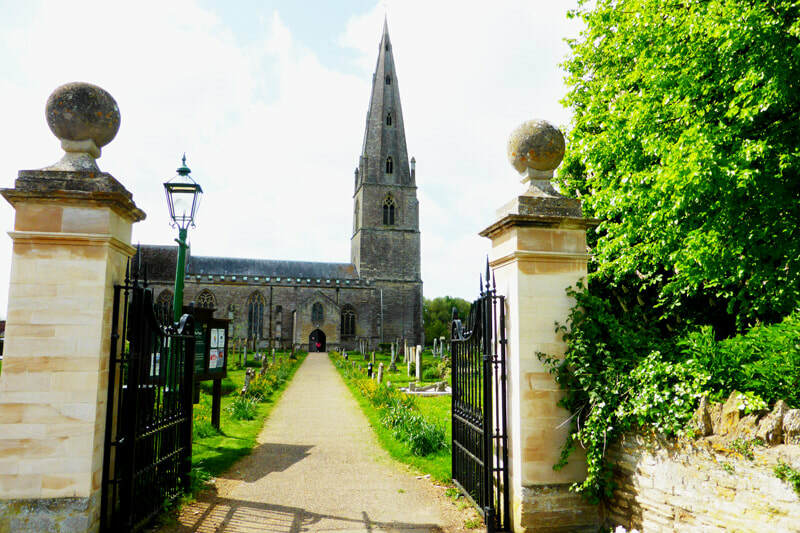 Make your way into the church yard but before going into the church, follow either path around to the rear of the church yard where you will find John Newton’s tomb. 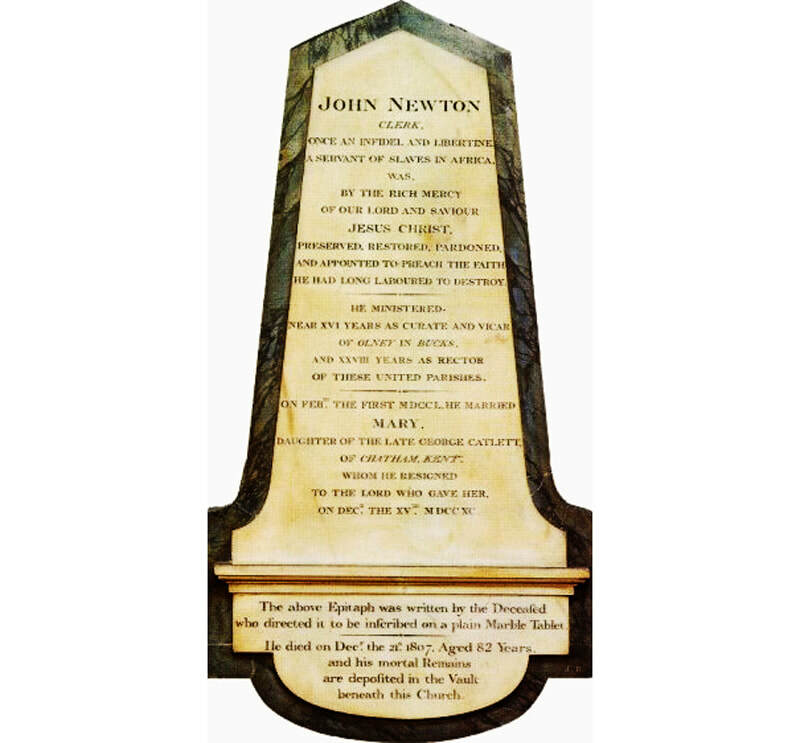 John Newton was not originally buried here in the church yard. When he died in 1807, he was laid-to-rest next to his adored wife in the crypt beneath the church of St Mary Woolnoth in London where he was vicar for 27 years. At the end of the 19thCentury the crypt of St Mary’s became part of the new London Underground system and the bodies of John and Mary Newton needed a new resting-place. 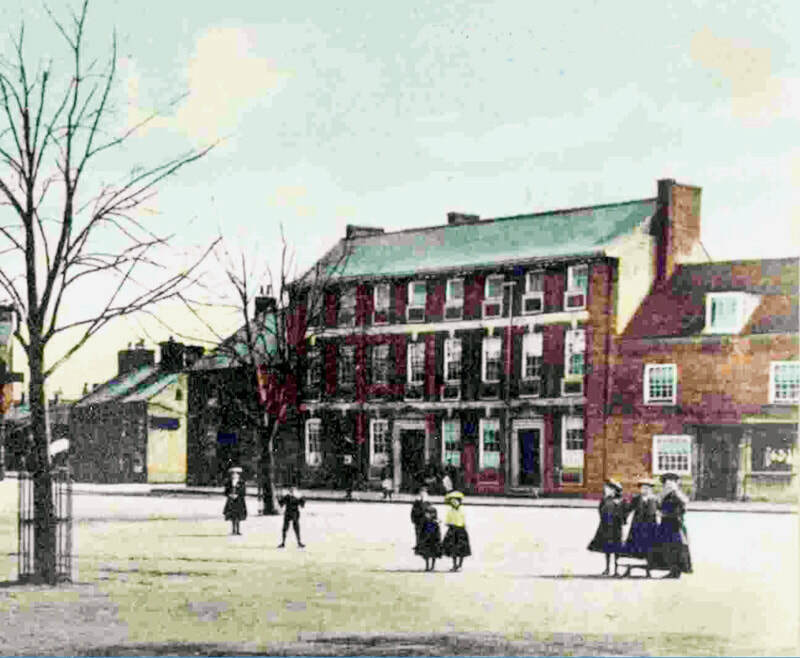 By January 1893, the Newton’s were re-interred here in Olney near to where his father-in-law George Catlett is buried. The Great House was demolished in the 19thcentury and a private house is built on the site. However, parts of the building were re-used around the town & you will have passed the stone balls from the gate to The Great House on the pillars of the church gateway. 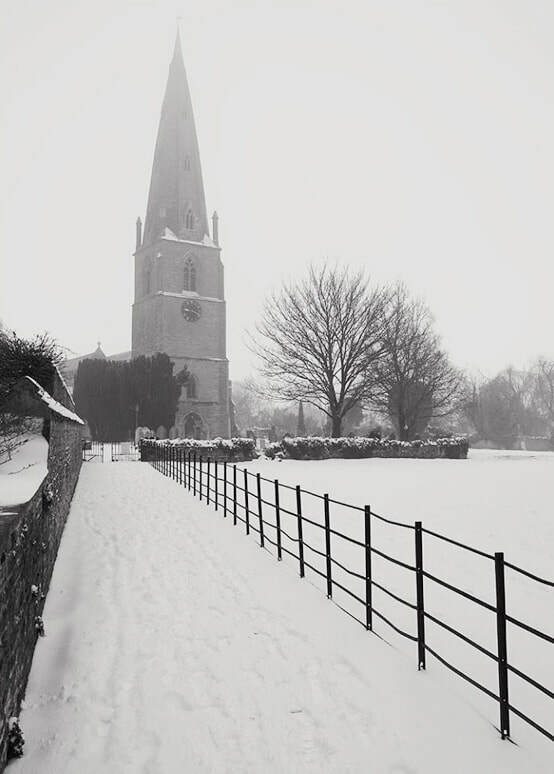 Make your way into the Church of St Peter & St Paul but please be aware for any services which may be being held. Most of the church architecture and furniture dates from the 14thcentury with repairs & renovations from the 19thcentury. John Newton was curate in charge of the church from 1764 to 1780 when he moved as Vicar to the church of St Mary Woolnoth in London. During his services John preferred to preach extempore – without referring to notes – but he carefully prepared his message beforehand in a sermon notebook. His reputation soon spread and people came from far and wide to hear him preach. A new gallery was built so everyone who came to hear him could fit inside. Newton’s Gallery and William Cowper’s seat within it survived until 1904. 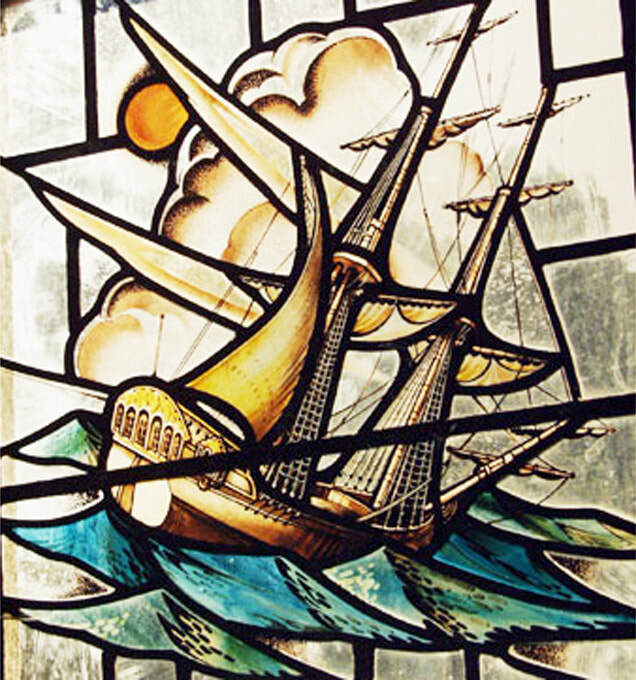 You will also find within the Lady Chapel 2 stained glass windows which show the milestones in the lives of Cowper and Newton. In the south-western corner is a pulpit which was found in Northampton’s old prison. It is said by some to have been Newton’s pulpit, although no one really knows for sure. 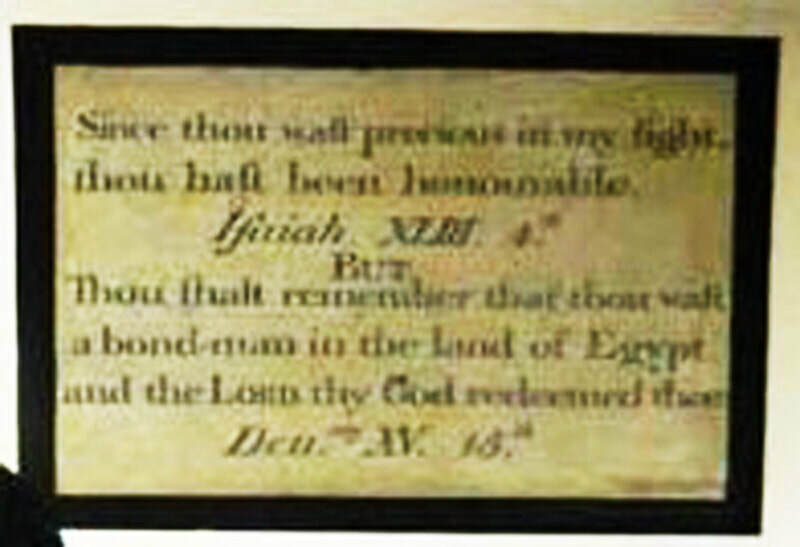 Here you will also find the brass plate from Newton’s coffin. Thomas Scott (1747-1821) who also vicar here till 1785 - he is best known for his commentary on the Bible which was admired by William Wilberforce. Henry John Gauntlett (1805-1876), the celebrated organ designer, organist, and composer began his career aged nine as his father's organist at Olney. His most famous tune today is the tune to which “Once in Royal David’s City” is usually sung. If you would like more information about the church, you are able to buy a short guide. Could we also encourage you to consider making a small donation towards the up keep of this wonderful building and its work. The Guinea Orchard sits between the gardens of William Cowper’s house and John Newton’s Vicarage. It’s called the Guinea Orchard because Cowper & Newton paid its owner one pound and one shilling (known as a Guinea) for permission to cross it when they wanted to meet. This meant that they didn’t have to go the long way around and use the road. Newton would have used the route many times during January 1773 to shuttle back and forth from his Vicarage to check on the condition of Cowper who was suffering one of his most serious episodes of what we would now recognize as clinical depression. With care and attention from Mary Unwin, John & Polly Newton, William slowly recovered from his severe depression and resumed a more active life in Olney. You can find out more about his life in our other walk. 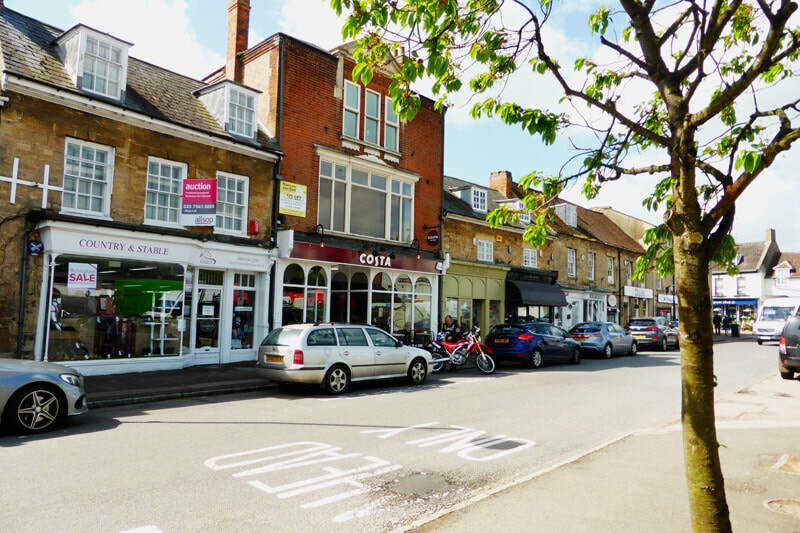 Not long after John’s arrival in Olney he began to receive offers of other posts elsewhere. In 1780 he finally accepted the post of Vicar at St Mary Woolnoth, London although he kept his contact with Olney through visits and letters to friends for many years. To return to Market Place take the right hand path through the Lychgate beside the Pegasus Manor House, and then turn left again. Or take the left hand path and take one of the alleyways through to the High Street or Market Place.